I have a fascination with vintage photos, particularly children and women. I find them inspirational and also a wonderful reference resource. This photo is from Dargie's photostream on Flickr. Hi Sue, thanks for stopping by and the kind thoughts! It's much apprieciated! I love this photo.. so funny! That is a darling photo! Oh Sue...this is hilarious! You are right, the lad in the middle is giggling his head off..I wonder what they were talking about? hmmmmmm giggle, giggle, giggle! Thanks again! Your beautiful words makes that next to me grows up a meadow with beautiful flowers with shape of letters! Thank you for what you tell me, these pics are very inspiring! photos, and also a poignancy. I love to find an old photo that has some information about it - even then your imagination still builds on that. I'm glad that everyone has enjoyed this one. 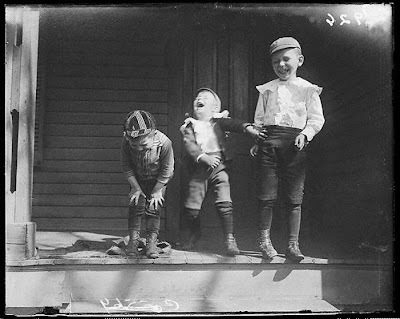 These little boys, frozen in a moment, immediately captured me. OMG that boy in the center is so inspiring. I love laughing like that. thanks for sharing SUe! !